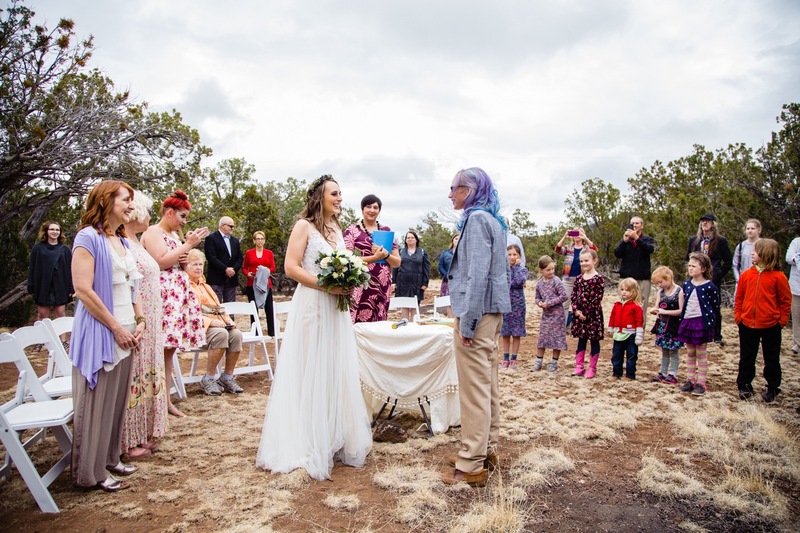 Molly and Shannon’s outdoor Forest wedding near Flagstaff, Arizona was so beautiful. And super fun. How can you go wrong when most of their friends are theater people? You can’t! These two had their wedding celebration at Molly’s mom’s house. It threatened to rain all day but nobody worried. Their guests created a spiral aisle for Molly and Shannon to walk through and then everybody formed a circle around them. sometimes folks include a unity candle ceremony. Molly and Shannon’s moms created a unity sandwich! Nice! Their ceremony was beautiful with such heartfelt vows. Afterwords, we tromped around the forest making a bunch a rad portraits. And then after dancing and some pretty epic karaoke, the clouds parted enough to make a fantastic Arizona sunset. Enjoy!